The concept of layer "node"
The Keras functional API is the way to go for defining complex models, such as multi-output models, directed acyclic graphs, or models with shared layers. This guide assumes that you are already familiar with the Sequential model. Let's start with something simple. The Sequential model is probably a better choice to implement such a network, but it helps to start with something really simple. Such a model can be trained just like Keras Sequential models. With the functional API, it is easy to re-use trained models: you can treat any model as if it were a layer, by calling it on a tensor. Note that by calling a model you aren't just re-using the architecture of the model, you are also re-using its weights. # this works, and returns the 10-way softmax we defined above. This can allow, for instance, to quickly create models that can process sequences of inputs. You could turn an image classification model into a video classification model, in just one line. # this applies our previous model to every timestep in the input sequences. # so the output of the layer below will be a sequence of 20 vectors of size 10. Here's a good use case for the functional API: models with multiple inputs and outputs. The functional API makes it easy to manipulate a large number of intertwined datastreams. Let's consider the following model. We seek to predict how many retweets and likes a news headline will receive on Twitter. The main input to the model will be the headline itself, as a sequence of words, but to spice things up, our model will also have an auxiliary input, receiving extra data such as the time of day when the headline was posted, etc. The model will also be supervised via two loss functions. Using the main loss function earlier in a model is a good regularization mechanism for deep models. Let's implement it with the functional API. The main input will receive the headline, as a sequence of integers (each integer encodes a word). The integers will be between 1 and 10,000 (a vocabulary of 10,000 words) and the sequences will be 100 words long. # headline input: meant to receive sequences of 100 integers, between 1 and 10000. # note that we can name any layer by passing it a "name" argument. # into a sequence of dense 512-dimensional vectors. 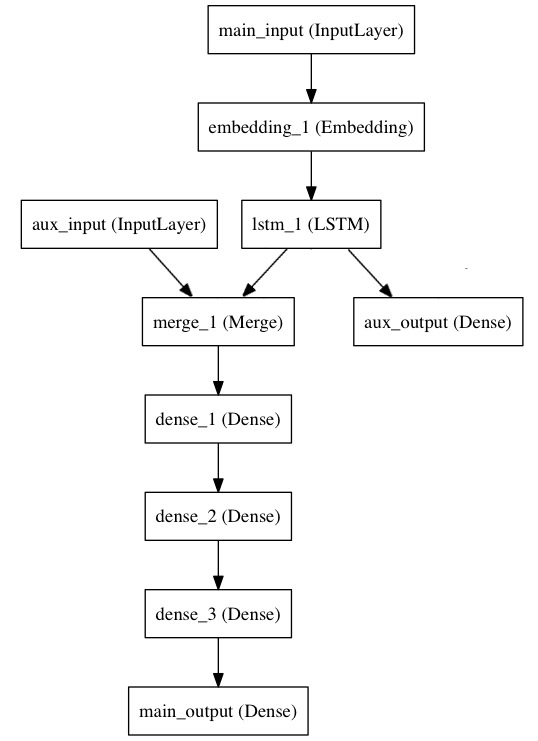 Here we insert the auxiliary loss, allowing the LSTM and Embedding layer to be trained smoothly even though the main loss will be much higher in the model. We compile the model and assign a weight of 0.2 to the auxiliary loss. To specify different loss_weights or loss for each different output, you can use a list or a dictionary. Here we pass a single loss as the loss argument, so the same loss will be used on all outputs. Another good use for the functional API are models that use shared layers. Let's take a look at shared layers. Let's consider a dataset of tweets. We want to build a model that can tell whether two tweets are from the same person or not (this can allow us to compare users by the similarity of their tweets, for instance). One way to achieve this is to build a model that encodes two tweets into two vectors, concatenates the vectors and adds a logistic regression of top, outputting a probability that the two tweets share the same author. The model would then be trained on positive tweet pairs and negative tweet pairs. Because the problem is symmetric, the mechanism that encodes the first tweet should be reused (weights and all) to encode the second tweet. Here we use a shared LSTM layer to encode the tweets. Let's build this with the functional API. We will take as input for a tweet a binary matrix of shape (140, 256), i.e. a sequence of 140 vectors of size 256, where each dimension in the 256-dimensional vector encodes the presence/absence of a character (out of an alphabet of 256 frequent characters). Let's pause to take a look at how to read the shared layer's output or output shape. In previous versions of Keras, you could obtain the output tensor of a layer instance via layer.get_output(), or its output shape via layer.output_shape. You still can (except get_output() has been replaced by the property output). But what if a layer is connected to multiple inputs? hence the notion of "layer output" is ill-defined. Code examples are still the best way to get started, so here are a few more. For more information about the Inception architecture, see Going Deeper with Convolutions. For more information about residual networks, see Deep Residual Learning for Image Recognition. # this returns x + y. This model re-uses the same image-processing module on two inputs, to classify whether two MNIST digits are the same digit or different digits. This model can select the correct one-word answer when asked a natural-language question about a picture. It works by encoding the question into a vector, encoding the image into a vector, concatenating the two, and training on top a logistic regression over some vocabulary of potential answers. # first, let's define a vision model using a Sequential model. # this model will encode an image into a vector. # next, let's define a language model to encode the question into a vector. # and we will index words as integers from 1 to 9999. # the next stage would be training this model on actual data. Now that we have trained our image QA model, we can quickly turn it into a video QA model. With appropriate training, you will be able to show it a short video (e.g. 100-frame human action) and ask a natural language question about the video (e.g. "what sport is the boy playing?" -> "football").